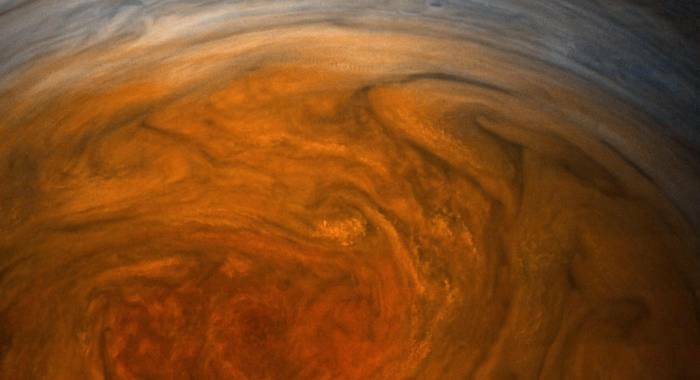 Of all the planets in our Solar System, Jupiter is probably the most interesting to look at. It’s just a big ball of fast-moving gasses in all kinds of wild colors. The planet hosts storms that could swallow the entirety of Earth, and while we can see lots of neat things happening near the planet’s cloud tops it’s a lot more difficult to determine what is actually going on deeper inside the planet. Now, thanks to some fancy calculations and jet stream models inspired by Earth’s own weather patterns, researchers have a new theory on just why Jupiter’s crazy bands seem so perfectly arranged. In the study, which was published in The Astrophysical Journal, scientists explain that the jet streams on the planet are likely cut off by magnetized gasses deeper within the planet. The jet streams control the flow of gasses around the planet’s outer atmosphere where colorful bands of ammonia twist around the planet. These jet streams stretch many miles into the planet, but stop once they reach the magnetized gasses closer to its center. “The gas in the interior of Jupiter is magnetised, so we think our new theory explains why the jet streams go as deep as they do under the gas giant’s surface but don’t go any deeper,” Dr. Jeffrey Parker of the Livermore National Laboratory explained in a statement. We know jet streams on Earth work in a roughly similar way, but the difference between Jupiter and our own planet is that the streams on the gas giant don’t have a rocky surface underneath to disrupt them. We know that the clouds on Jupiter stretch for thousands of miles into the planet thanks to observations by NASA’s Juno probe, and the planet’s strong magnetic field is thought to play a role in how they are arranged. If you want to dive into the nitty gritty of the work, put on your thinking cap and prepare for plenty of calculations. It’s some very deep stuff. Read the original article on bgr.com.